Pimples and red hair . . . They say a picture can tell a thousand words, then surely there must be another thousand that it doesn’t tell, here’s a few words this picture spoke to me: The two surfboards in the centre of this picture are brimming with creativity yet they didn’t just arrive from overseas in a shipping container, the story of these boards actually started 47 years ago when a pimply kid with freckles and long blond hair impatiently peeled the fibreglass off a Dunlop he brought for $40 from a farmer in the hills behind Waipu. His father (by the same name, without the pimples but with freckles and hair in a red tone and short in length) had just feed the dunger through a bandsaw at his work while the boy watched on as the blade ripped around the pencilled outline. The outline had been marked on the glass by tracing around the boys older brother Richard’s 5’10” Bob Davie Alan Byrne model single fin. There’s much more to the story of how that bright orange 5’4” single fin emerged as the first surfboard built by the thirteen year old that was me! My point is that all those years, blood sweat and tears ago I just knew that I had to make it. There was an importance to the task that I doubt I understood at the time yet the experience speed me down a path that I have never really strayed from, a life’s journey in the making. Little did I know that all these years later I would be standing in my surfboard factory showroom at days end on a Saturday evening with a beer in my hand marvelling at what Rhys, Bryce and I had created in these two boards. Up until that moment we had simply been busy making them. 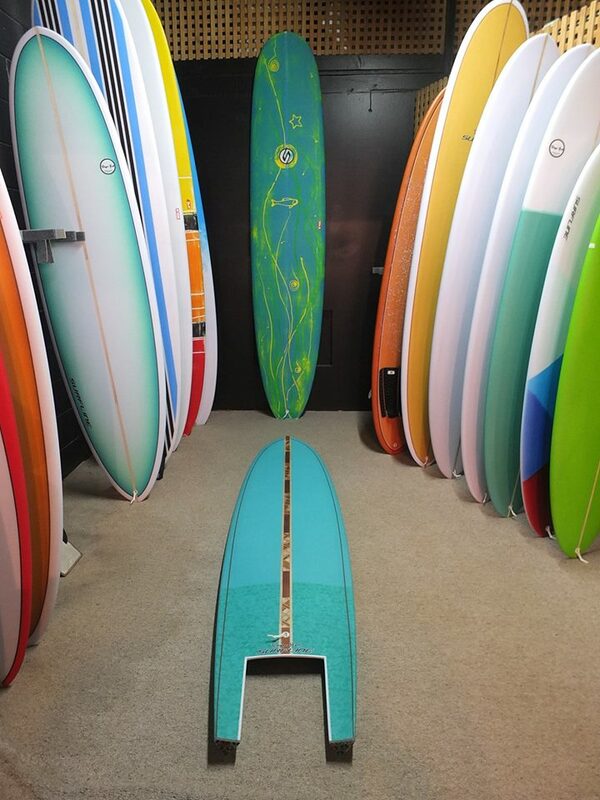 Take the board against the wall: It’s a 9’3” Sugar Glider custom for Steve. The shape is a proven smile maker and that in it’s self is enough to make me smile, partly because I’m confident it will have the same effect on Steve when he rides it. Also partly because I saw the creativity first hand flowing live as Rhys and Bryce completed the brief of “do what ever you feel” on the graphics. There’s a lot of trust in that and the boys nailed it in my opinion, given that there was a million and one things they could have done. Beyond the graphic is the way they actually created it using the standard steps and stages of surfboard building techniques to lay down multiple layers of colour which covered each proceeding colour as they went. Before Rhys sanded this board it was a single shade of blue all over. I also shine internally at the thought that this board will bring years of enjoyment to those who ride it and as a side effect of being well made with an exceptionally long life span we might get a few more rotations from the planet. Then there’s the 7’7” Double Hot Curl laying on the carpet that the thirteen year old kid (by now trapped in a 60 year old man’s body) had dreamed up one and a half years earlier. Finally here it is, waiting for wax and waves, how exciting! Apart from the experimental shape, the woodwork and the peace signs glassed into the tails, the brief to Rhys had been the same. All I said was “I don’t have a green one, do whatever you want”. I couldn’t be happier with the result and I’m looking forward to the pick up day when both Steve and I will repeat the process of appreciation, in that same showroom with a beer in our hands and a warm smile on our faces . . .